A teacher’s life in primary and secondary compared. As you may know, I’m a secondary teacher. More specifically, my rather grand title is Lead Teacher for Maths and Transition. I’m a maths and geography teacher, splitting my time almost equally between the two, and solely in Key Stage 3. However, before that I was, for twelve years, a primary teacher. Now it’s not unheard of for teachers to “switch codes” like this but it’s still pretty unusual. I know this because every time I have told a primary or secondary teacher that this is what I’ve done, the same sort of quizzical look comes over their face. I’m not going to say which one I prefer and there is a simple reason for this. I don’t know. I have felt like an NQT this year. I’ve taught unfamiliar content to an unfamiliar age group in an unfamiliar setting. It’s been pretty hard at times so it wouldn’t be fair to judge just yet. However, there are differences I can pinpoint already and I can also talk about how the obvious differences manifest themselves in my everyday work. I reckon you’d worked this one out. The interesting thing is how staff in primary and secondary view the average pupil from each others settings. Some secondary teachers have an image of primary pupils as little kids running around with snotty noses all day and who can’t do anything for themselves. From my experience, when primary children reach Year 4, 5, and 6 and in some cases before this, many are developing into autonomous and self-motivated learners. They run tuck shops, answer the phone, lead clubs in ICT, sport and music, organise charity events and participate in school councils. So where does their terrible reputation come from? Well, when these previously independent and autonomous children reach secondary school, the secondary system can’t really let this independence continue in the same way. Logistically, 1000-1500 pupils need to be in the right place, at the right time, with the right teacher and that needs sorting. Flexibility is much more difficult. Another factor is the myriad of different sets of expectations laid down by each of their 10 or so teachers. They are used to the little ways of one or maybe two teachers in primary school. Then things change and the list of success criteria, in terms of classroom management, grows and grows. That’s one reason Year 7 pupils will ask questions like “Shall I rule off again?” and “Shall I write the date?” I think some simply lose the confidence in their ability to know what the right thing to do is. Meanwhile, some primary teachers claim, only half-jokingly, that they couldn’t teach secondary, having the belief that secondary pupils are hormone addled, surly and bad-mannered. All true at times, but in nowhere near as many cases as we’ve been led to believe. In a nutshell, I think many primary school teachers would be very surprised at how many of their skills are transferable. 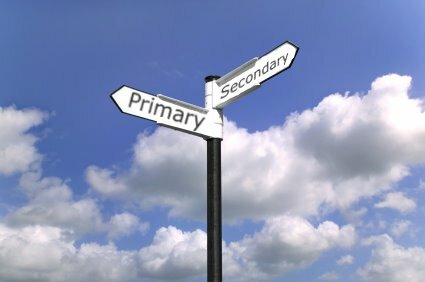 Likewise, just as many a secondary teacher might have perceptions changed in terms of just how independent primary school children can become and a bit shocked that they wouldn’t be wiping noses all day. They might enjoy it. After all, the reasons we came into the job can’t be that different. So, did you ponder carefully which age group to teach, or do you feel you made the right choice in not even considering a career in teaching? More soon… but I’d love to hear your thoughts in the meantime.